I feel that the most relevant content theory on motivation for me is the Maslow’s hierarchy of needs. Maslow published the theory originally in 1943. He believes that people are wanting being, they always want more, and what they want depends on what they already have. He suggests that human needs are arranged in a series of levels, a hierarchy of importance. Maslow identified eight innate needs, including the need to know and understand, aesthetic needs and the need for transcendence . However, the hierarchy is usually shown as ranging through five main levels , from, at the lowest level, psychological needs, through safety needs, social needs and esteem needs, to the need for self-actualisation at the highest level. 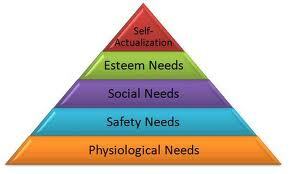 The hierarchy of needs may be shown as a series of steps but is usually displayed in the form of pyramid. This is an appropriate form of illustration as it implies a thinning out of needs as people progress up the hierarchy. These include homeostasis (the body’s automatic efforts to retain normal functioning) such as satisfaction of hunger and thirst, the need for oxygen and to maintain temperature regulation. Also sleep, sensory pleasures, activity, maternal behaviour and, arguably, sexual desire. These include safety and security, freedom from pain or threat of physical attack, protection from danger or deprivation, the need for predictability and orderliness. Often referred to a love needs. These include affection, sense of belonging, social activities, friendship, and both the giving and receiving of love. Sometimes referred to as ego needs. These include both self-respect and the esteem of others. Self-respect involves the desire for confidence, strength, independence, freedom, and achievement. Esteem of others involves reputation or prestige, status, recognition, attention and appreciation. This is the development and realisation of one’s full potential. Maslow sees this as ‘What human can be, they must be’ or ‘becoming everything that one is capable of becoming’. Self-actualisation needs are not necessarily a creative urge and may take many forms which vary widely from one individual to another. I’m studying Business & Finance at Bucks New University and I’m highly motivated student due to the fact I want to graduate from University, broaden my knowledge about line of business and find a well-paid job providing services in business sector afterwards. Studying in England is a big chance in my life because it is a main language in the world. Having a good command in English can help me in finding work almost in every country in the world. In my opinion the person who made the biggest impact on motivating me to get here was my mum. She didn’t have chance to study abroad and learn English. She was always repeating that studying in High Wycombe is the best thing what could ever happen to me at that time. Moreover, it is not only about my mother but all my family, friends and teachers from high school were also persuading me to come here and studying at Bucks New University. Nevertheless I was also motivating myself because I know that this decision I made will be a good choice. For the next 2-3 years the factors which will be motivating me are first and foremost pursuing the goal I intend to achieve, knowledge and feedback I will be getting from my tutors during this period and moral support from my loved ones. In my opinion at the moment I’m on the 3rd level of Maslow’s hierarchy of needs. I achieved the first free needs: psychological, safety and social. I have enough money to satisfy mu hunger and thirst, I feel safe in this town, at home and university, I have a lot of friends with whom I can share my problems. My dream is to reach the 4th and the last 5th level which will also motivate me in the future during studying. At university I will be learned how to be confidence, assertive and independent in using all the abilities for my future job. I would like to be appreciated by family and tutor’s for achievements I will accomplish. Moment when I was de-motivated it was not long time ago. It happened when I worked in my part-time job as a waitress. It was a dinner in one of the hotel. Me and my colleagues were working with the supervisor of the hotel. He was upset from the beginning and wasn’t polite towards us, sometimes even rude. However I still wanted to do my work best and decided to offer guests more bread. Some of them agreed. But after 2 minutes he took me in private and started to shouting at me. He asked me why had I done it because he didn’t ask me to do that, it didn’t belong to my duties. After that I was angry with him because I only wanted to do something good, it was really confusing, I felt really de-motivated. I think that time I did a step back in the Maslow’s hierarchy of needs to safety needs. I didn’t feel the sense of belonging in our team I just wanted to go home as soon as possible. Unfortunately I had to stay there to the end of my shift. In the end of the work the supervisor asked me if we could talk for a minute. I didn’t want that because I thought he would like to complain about what I did during dinner. To my surprise he apologised me for his behaviour and said that he had some problems at home and that was why he behaved in this way. The supervisor said he didn’t have right to criticise me for what I did and even thanked that I took care of guests. It made me feel better and I understood that everybody has sometimes bad day and has to work under pressure but we have to manage with that. Summing up I think Maslow was right in his theory. To became the most successful in our job, school and life environment we have to strive for the last level of self-actualisation. During that progress we will have a lot of downs which will move us back to the lower levels but we can’t give up and must keep pursuing the goals. Detailed work Magda, and good personal experiences included, I'm sure you will achieve your goal, just keep going. Remember to reference throughout not just at the end.